In this solo podcast episode, I go over the most important reason why you need to expand beyond Amazon. You’ll learn 6 easy to implement strategies on how to sell more to your existing customers and boost your sales significantly. Steve: You are listening to the My Wife Quit her Job Podcast, the place where I bring on successful bootstrapped business owners and delve deeply into what strategies are working and what strategies are not with their businesses. 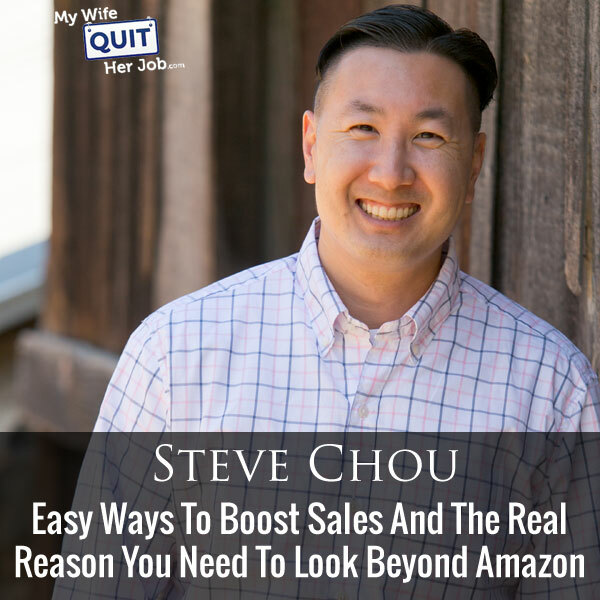 I’m Steve Chou and today we’re doing another solo episode where I’m going to discuss six simple ways to grow your business by selling to your existing customers. But before we begin I want to give a quick shout out to Privy who is a sponsor of the show. Now, I’m super excited to talk about Privy, because I use and rely on Privy to build my email list for both my blog and my online store. Now what does Privy do? Privy is an email list growth platform, and they manage all of my email capture forms, and in fact I use Privy hand in hand with my email marketing provider. Now there is a bunch of companies out there that will manage your email capture forms, but I like Privy because they specialize in ecommerce stores. Now Privy is easily the most powerful platform that I’ve ever used, and you can trigger sign up forms based on any primer that you desire. So for example let’s say you offer free shipping for orders over 100 bucks, well you can tell Privy to flash a popup when the customer has $90 in their shopping cart to urge them to insert one more item into their cart. Here’s another cool use case, if someone has item A in their shopping cart, I can easily tell Privy to display a unique and special coupon code for that item or display a related item or offer. In terms of email capture, right now I’m showing a different email lead magnet depending on what product a customer is browsing in our shop. I also want to give a quick shout out to Klaviyo who is also a sponsor of the show. Now I’m also blessed to have Klaviyo as a sponsor because they are the email marketing platform that I personally use for my ecommerce store, and I actually depend on Klaviyo for over 20% of my revenues. Now you’re probably wondering why Klaviyo and not another provider. Well Klaviyo is the only email platform out there that is specifically built for ecommerce stores, and here is why it is so powerful. Klaviyo can track every single customer who has shopped in your store and exactly what they bought which makes it extremely powerful. So let’s say I want to send an email to everyone who purchased a red handkerchief in the last week, well that’s easy. Let’s say I want to set up a special autoresponder sequence to my customers depending on what they purchased, piece of cake, and there’s full revenue tracking on every single email. Klaviyo is the most powerful email platform that I’ve ever used and you can actually try them for free at mywifequitherjob.com/Klaviyo, and that’s spelled K-L-A-V-I-Y-O. Once again that’s mywifequitherjob.com/Klaviyo. Now on to the show. Steve: Welcome to the My Wife Quit Her Job Podcast, today I’m doing another solo episode, and I’m here to discuss the number one reason why you need to be expanding beyond Amazon, beyond eBay, beyond Etsy and one of a third party market place that you happen to be using. I’m going to show you six simple ways to make recurring revenue off of your existing customers which is really something that you can’t do if you’re relying on some of these third party market places, so let’s talk about that for a moment. In general it is much easier to sell to an existing customer than it is to go out and find a brand new one. They know your brand, they trust you, they like you, and most importantly they’ve already spent money with you, so they’re willing to open their wallets. According to the small business administration, it is 65% easier to convert an existing customer than it is to find a brand new one, and from personal experience I think it’s actually way more than that. It is way easier to convert an existing customer than it is to find a new one. Just as an example, over the holidays email marketing which is to our existing customers account for over 21% of our revenues, a little under a third of our business are from repeat customers like event planners, hotels, small airlines, etc. All of our pay per click ads like Facebook ads, Google ads to our existing audiences have a ridiculously high ROI, something that like five or 6X return on ad spend. So if you aren’t doing so already, you really need to be paying more attention to your existing customer base rather than devoting all of your resources to finding new customers out there because it’s a lot more expensive to acquire a brand new customer. And just a quick note, everything that I am going to be talking about today you can’t do on Amazon, you can’t do on eBay, you can’t do on Etsy, because you don’t have customer emails, you can’t easily retarget your customers and bring them back. If you run ads to like an Amazon listing for example, you have zero conversion information. Now you can try to use Amazon affiliate links for links in your third party ads like Facebook or Google, but technically that’s actually against Amazon terms of service. You are not supposed to be driving affiliate revenue to your own listings online. So bottom line if you are relying on third party market places like Amazon, you’re actually missing out on a ton of sales. And here’s a funny statistic, for 2016 Amazon accounted for 15% of retail sales which basically means that there is 85% of business out there that is actually off Amazon, that’s actually another reason why you need to get off there as well. The other thing you also need to remember is that there is very little or no brand recognition on Amazon. So whatever your business that you’re getting now off the Amazon, it could actually disappear tomorrow, and I always like to reference this conversation that I had with my mum last year. My mum still to this day thinks that when you are shopping at Amazon, you’re actually buying on Amazon, and when I told her that we actually sold on Amazon, she was shocked because this entire time, she thought that Amazon just had every single product under the sun, and if my mum thinks that, chances are there is a lot more people out there that think the exact same way. All right so let’s switch gears a little bit and talk about some specific tactics on how to sell more to your existing customers. This first one may not apply to all businesses, but for my ecommerce store, we actually surprisingly attract a lot of business customers, and I was actually pretty shocked when I first discovered this. You might be surprised too with your business if you take the time to look. So the first step is to export all of your customers and all of your transactions to a spreadsheet. A lot of shopping carts like Shopify or BigCommerce allow you to do this right off the bat. If you’re using Klaviyo for your email marketing provider, you don’t even need to do this step because all the transactions it is built in to Klaviyo already. The next step is to flag customers who buy an abnormally large quantity of your goods. For example let’s say you’re using Klaviyo, I can create a segment of people who have purchased more than three dozen napkins. I’m choosing napkins in my example here because most people who buy napkins from us, they buy one dozen or at most two dozens for their own personal use. But in general anyone who is going to be buying three dozen or more, chances are those people are either running an event or they are running some sort of business. So these are the customers that I want to single out, the people who have a lot of purchasing power. You also want to scan the emails that you’re filtering out for your customers for signs of a business. So for example we found our first airline customer this way, in the email address was actually the name of the airline, and I recognized this airline name and instantly I knew it was a business customer. So you’re looking for business customers here, and once you have this list, pick up the phone and call them up. So let’s say I was calling that airline, I would say something like, “Thank you for your order, I just wanted to verify your deadline to make sure we get these linens to you on time.” Then once you have established a conversation, then you want to probe more into their business and establish a relationship. Mention that you want to be their single point of contact for future orders, and if you have any further questions, feel free to reach out to me directly. Here is my number, call me any time you have any needs, I’ll make sure your linens get to the destination on time, and boom instantly you have large consistent orders for life assuming that business has needs for recurring purchases. This actually works really well, we’ve gotten a lot of our larger customers this way, it’s amazing what picking up the phone does for business. Now contrast that if you’re buying on Amazon for example, sometimes people like a little bit of hand holding, so all of the event planners who are our customers, sometimes they have last minute requests, they need their stuff delivered on time, and they need that single point of contact to make sure that stuff gets there on time, and as you know for weddings timing is very crucial. That’s’ why it’s important to pick up the phone and actually call these customers on line. I just want to take a moment to thank ReferralCandy for being a sponsor of the show. Now for any ecommerce store word of mouth is huge, and when a customer is super happy with their purchase they will tell all of their friends. What if there was a way to amplify word of mouth about your company, what if there was a way to reward referrals for your business? This is where ReferralCandy shines, with just a couple of clicks of the mouse you could add a referral program to your ecommerce store and reward your customers for telling their friends about your shop. So that’s how you get more business customers. The next step you need to do is to look on that same spreadsheet and isolate out all of your repeat customers online. These people don’t necessarily buy in huge quantities from you, but they buy on a consistent basis. So here is the thing, we’ve targeted the wedding industry for such a long time that we actually didn’t realize that we actually had a repeat customer base, after all unless someone gets divorced, they aren’t coming back to buy more wedding linens. For years I thought all of our customers were actually one offs, but you can’t actually know unless you look. So once again take your spreadsheet, isolate all the people who have purchased more than once and what you want to do is once you have that list, you want to run special promotions and ads to these people because the conversion rate is going to be sky high. Push them to buy more items, email these customers more often because they are already a customer, they buy more than once, it doesn’t hurt to email them more often and treat them like loyalty. We actually have this one customer believe it or not who has purchased over 150 times from our store which is crazy. I’ve also met a bunch of people that frequently collect handkerchiefs; I had no idea that there are people out there like this. There are also people out there that use handkerchiefs to decorate their house or for various arts and crafts. Once you have these two lists, the business customers and the repeat customers, you can leverage the power of Facebook to scale your business by creating look alike audiences. So once again if you don’t have your email addresses and you are relying on Amazon and Etsy for this, you can’t do any of these things. Now just a recap if you guys aren’t familiar with Facebook ads, a look alike audience is when Facebook goes out and finds people that are within 99% of the people that you’ve uploaded to Facebook. So for example I can email my entire customer list of emails to Facebook, and they’ll find people that are within 99% of the same demographic. These are going to be 100% brand new customers that haven’t bought and are very highly likely to buy from you. Leveraging look alike audience incidentally is how a lot of companies scale and it works really well. So for example, I recently took my repeat customer list and generated an audience of 2 million people on Facebook that are 99% the same demographic to sell to within ten minute’s time. Right now I’m actually running a free plus shipping offer to two different look alike audiences, and they are converting quite well, because I’m relying on Facebook to find similar customers than the ones that I’ve already had. Very powerful and once again you can’t do this unless you have an email list. Once you have your customer base, you can easily cross sell them additional products as well. So once again if you go through your spreadsheet and look through your product mix, and you’ll probably find products that are very complimentary to each other. Find people who have purchased item A but have not bought a complimentary item B. Here is just a quick example from our store. If someone bought dinner napkins from our store, there is a high likelihood that they may want to buy place mats or cocktail napkins, so why not isolate these customers, send them an email, and then show them place mats or cocktail napkins. Why not run an ad to people who only purchase napkins and run them ad to get them to buy cocktail napkins or place mats. If someone bought a hankie, they might need a box, so why not reach out and see if we can up sell them a box. The customer at this point, they’ve already purchased from you, they trust you, they are willing to open their wallets, they’ve spent money with you and they would easily buy from you again, the friction is gone at that point. That’s another way to leverage your existing customers. Now you guys are probably listening to this cross selling and all these techniques, and it might sound a little bit tedious to you, but the way I do it, it’s actually fully automated. Once again I use Klaviyo and they are incidentally a sponsor of this podcast. If you’re interested in starting up for free, you can go to mywifequitherjob.com/Klaviyo, but with Klaviyo you can simply create a segment of people who purchased dinner napkins but not cocktail napkins. They’ll amass all the emails of people who exactly fit those characteristics, and then at that point you can send them emails directly, or you can export these audiences over to Facebook at a click of a button and instantly run Facebook ads to these people. This is very powerful and once again this is fully automated, I don’t really need to do anything about this. As I mentioned before, the number one problem with our store is that there aren’t enough people getting divorced in this country. I like to see the divorce rate go to up to over 90%, now just kidding but as I mentioned before wedding customers are our primary customers and they aren’t coming back. So what is a way to get these wedding customers to actually come back? Well you can’t really get them to come back, but you can get them to refer their friends. Here’s how it works, after a purchase you can provide your customer with an additional coupon or a gift card if they refer a friend, and then as a double bonus you could actually give that friend a discount on their next purchase as well. So it’s a win-win, and once again there is an easy way to do this by using a service like ReferralCandy who once again is a sponsor of the show, promo.referralcandy.com/steve if you’re interested in signing up. This is an easy to just facilitate referrals, because as you’ll discover as you are running your online store, word of mouth is going to be pretty huge, and anything you can do amplify this word of mouth is going to work really well. So once again if all of these other options that I’ve mentioned so far are tedious as well, well fine, just take your customer list and blast them an email with a coupon or a promotion. Once again you can’t do this on Amazon or eBay or Etsy, because you don’t have the list you can’t blast them an email, but if you’re really lazy and you just want to get some instant business, just send them out an email with a coupon code and it works like game busters. Here’s the thing I’ve noticed about coupons in general, a lot of times people end up spending the same amount as they were planning to spend regardless of the coupon amount, because they feel like they’re getting something for nothing already, and sometimes they actually even end up spending more than they were planning on spending. But here is the thing about discounts, you don’t want to send the discount to someone who would have purchased anyway, and you don’t want to give a higher discount than it’s necessary to actually get someone to buy. So here’s what you can do to segment your customers and incidentally this is what I do for mine. So if no one has purchased in two months, I give them a very small coupon. If they’ve purchased in the past and they haven’t purchased in two and a half months, I give them a larger coupon. If they haven’t bought in three months, I give them an even larger coupon, because if they haven’t bought from us in three months, chances are they aren’t coming back anyway, so this is kind of like a last digit effort to get them to come back. If they bought recently I don’t send them anything, although the people who are repeat customers and very loyal customers, I’ll often send them special promotions just to make them feel better for being a loyal customer. So this is how I run my promotions so that I don’t overspend or over discount anything online. So here is the thing about your customer list, it is an endless source of repeat business and allows you to lay a foundation for your revenue, and if you think about it this way, having repeat customer is like running a SaaS business. It’s similar to SaaS for software because it’s recurring revenue. Once again if you’re only selling on Amazon, Etsy or eBay then you can’t take advantage of this, you don’t have emails. You can’t contact your customers, you can’t run good external ads like Facebook ads because you won’t have the conversion data, you have no idea whether a customer is converting or not. You won’t have brand equity, grandmas all over the nation will think that they are shopping at Amazon and not from you, you’re not going to have any brand equity, you can’t establish a foundation for your business. I’m not saying that you should stop selling on Amazon, Amazon is great for cash flow but you need to start laying a foundation for your business, because your business on Amazon could disappear at any time, people are not going to be loyal to you, Amazon can ban you at any time, there is going to be another listing for your exact same product at half the price, and obviously some people will buy that listing and save yours. So really the only way to future proof your business is to establish your own brand, your own customer list, and it provides a foundation for your business because those people are going to be buying from you again, again and again. All right, so I hope you guys found this valuable, just now I’m going to take a peak on Facebook live to see if there are any questions I can answer. Hope you enjoyed that episode, hopefully I demonstrated to you how crucial it is to own your own customers and your own platform. And if you’re relying on Amazon or any other marketplace for that matter as your only source of revenue, then you’re missing out. For more information about this episode, go to mywifequitherjob.com/episode152. Once again I want to thank klaviyo.com for sponsoring this episode. Klaviyo is my email marketing platform of choice for ecommerce merchants, and you can easily put together automated flows like an abandoned cart sequence, a post purchase flow, a win back campaign, basically all of these sequences that will make you money on auto pilot. So head on over to mywifequitherjob.com/Klaviyo, and that’s K-L-A-V-I-Y-O, once again that’s mywifequitherjob.com/Klaviyo. I also want to thank privy.com for sponsoring this episode. Privy is the email capture provider that I personally use to turn visitors into email subscribers, therefore email capture, exit intent, and site targeting tools to make it supper simple as well. I like Privy because it is so powerful and you can basically trigger custom pop ups for any primer that is closely tied to your ecommerce store. And if you want to give it a try it is free, so head on over to privy.com/steve. That’s privy.com/steve. Awesome info Steve. I have got email addresses from running contests. Can I run lookalike ads on these lists? I really loved this podcast and found it very helpful. How? I struggle with technology and came onto this course to learn about e commerce. At the same time as all this takes huge amounts of time I have been struggling with that to choose first – starting an Amazon store (which I understand is to get a money flow) or to just start the real business website and concentrate on that. Its a huge learning curve anyway. I wonder if I can use most of what I learn here to just start the website and forget about the amazon store? All in all I am learning a lot and thank you for that. I want to better understand what does Klaviyo do that Privy cannot and visa versa? I ues Shopify for my e-commerce store by the way. I searched through Amazon’s affiliate TOS for info about using links to your own products and couldn’t find anything. Could you post the policy or a link to it? Thanks so much!